You'll visit kid-friendly attractions like Coca-Cola London Eye and St. James's Park. There's still lots to do: take in the views from Tower Bridge, admire the masterpieces at National Gallery, get a sense of history and politics at Houses of Parliament, and step into the grandiose world of Buckingham Palace. For reviews, photos, where to stay, and more tourist information, use the London road trip planner. Auckland, New Zealand to London is an approximately 27-hour flight. You can also do a combination of bus and flight; or do a combination of train, bus, and flight. The time zone difference moving from New Zealand Standard Time to Greenwich Mean Time is minus 12 hours. Expect a bit warmer weather when traveling from Auckland in June: highs in London hover around 23°C, while lows dip to 13°C. Finish your sightseeing early on the 23rd (Sun) so you can take a train to Calais. For traveler tips, reviews, other places to visit, and other tourist information, use the Calais day trip planning website . Auckland, New Zealand to Calais is an approximately 41-hour flight. You'll gain 11 hours traveling from Auckland to Calais due to the time zone difference. When traveling from Auckland in June, plan for a bit warmer days and about the same nights in Calais: temperatures range from 22°C by day to 13°C at night. Finish your sightseeing early on the 25th (Tue) so you can travel to Copenhagen. 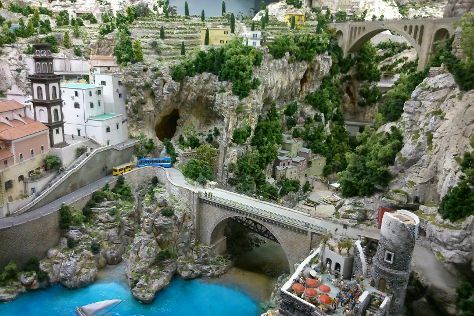 Start off your visit on the 24th (Mon): don't miss a visit to Atomium and then find something for the whole family at Mini-Europe. To see more things to do, traveler tips, ratings, and other tourist information, go to the Brussels trip itinerary planning tool . Getting from Calais to Brussels by car takes about 2 hours. Other options: take a train; or take a train. In June, plan for daily highs up to 23°C, and evening lows to 12°C. Wrap up your sightseeing on the 24th (Mon) early enough to take a train to Amsterdam. Start off your visit on the 25th (Tue): stroll through ARTIS, then enjoy some diversion at Museumphoto, and then explore the world behind art at Van Gogh Museum. 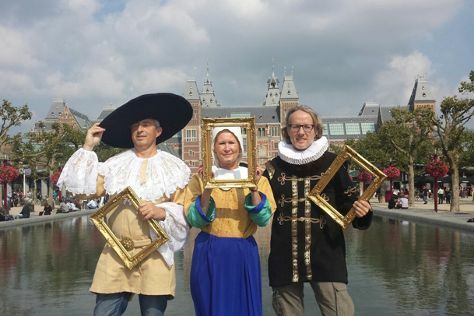 Get ready for a full day of sightseeing on the 26th (Wed): explore the engaging exhibits at NEMO Science Museum, admire the masterpieces at Rijksmuseum, and then see the interesting displays at Anne Frank House. For traveler tips, reviews, other places to visit, and more tourist information, read our Amsterdam online attractions planner . Getting from Brussels to Amsterdam by train takes about 2 hours. Other options: drive; or fly. Expect a daytime high around 23°C in June, and nighttime lows around 13°C. Finish up your sightseeing early on the 26th (Wed) so you can travel to Hamburg. On the 27th (Thu), walk around Park Planten un Blomen, then test your problem-solving skills at popular escape rooms, and then browse the exhibits of Miniatur Wunderland. To find ratings, traveler tips, photos, and tourist information, you can read our Hamburg trip planner . Do a combination of flight and train from Amsterdam to Hamburg in 4 hours. Alternatively, you can fly; or drive. In June, daily temperatures in Hamburg can reach 24°C, while at night they dip to 12°C. Wrap up your sightseeing on the 27th (Thu) early enough to travel to Copenhagen. 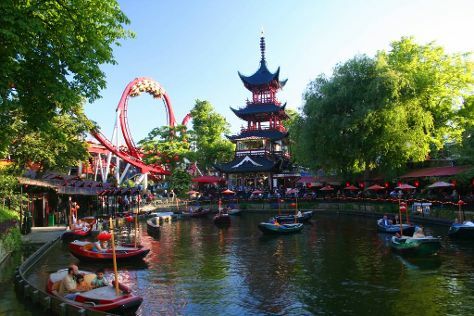 You'll visit kid-friendly attractions like Tivoli Gardens and Nyhavn. There's much more to do: see the interesting displays at Ny Carlsberg Glyptotek, admire the striking features of Oresund Bridge, enjoy breathtaking views from Rundetaarn, and take an in-depth tour of National Museum of Denmark. To see ratings, more things to do, other places to visit, and tourist information, refer to the Copenhagen trip planner . Traveling by flight from Hamburg to Copenhagen takes 4 hours. Alternatively, you can drive; or take a train. Expect a daytime high around 22°C in June, and nighttime lows around 11°C. Finish your sightseeing early on the 1st (Mon) so you can travel to Berlin. Kick off your visit on the 1st (Mon): get a sense of history and politics at Reichstag Building. Get ready for a full day of sightseeing on the next day: steep yourself in history at Mauermuseum - Museum Haus am Checkpoint Charlie, appreciate the history behind The Holocaust Memorial - Memorial to the Murdered Jews of Europe, then observe the fascinating underwater world at Zoo Berlin, and finally meet the residents at AquaDom & SEA LIFE Berlin. To see maps, ratings, photos, and other tourist information, use the Berlin sightseeing tool . You can fly from Copenhagen to Berlin in 4 hours. Other options are to take a train; or take a bus. You will have some time to spend on the 3rd (Wed) before leaving for Prague. Start off your visit on the 3rd (Wed): have some family-friendly fun at Golem VR and then wander the streets of Old Town Square. 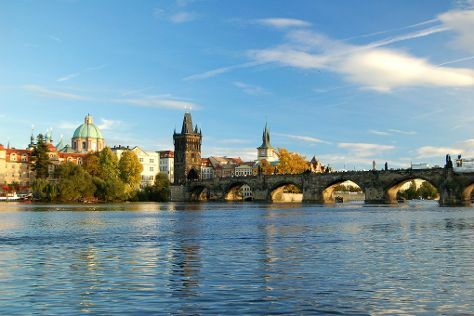 Get ready for a full day of sightseeing on the 4th (Thu): admire nature's wide array of creatures at Prague Zoo, then appreciate the extensive heritage of Prague Castle, and then take some stellar pictures from Prague Astronomical Clock. To find reviews, maps, other places to visit, and more tourist information, refer to the Prague itinerary planning app . Getting from Berlin to Prague by car takes about 3.5 hours. Other options: fly; or take a train. Expect a daytime high around 30°C in July, and nighttime lows around 17°C. You will have some time to spend on the 5th (Fri) before leaving for Bratislava. Kick off your visit on the 5th (Fri): have some family-friendly fun at Mackafe (cat cafe). To see traveler tips, other places to visit, where to stay, and more tourist information, go to the Bratislava trip itinerary planning app . Traveling by car from Prague to Bratislava takes 3.5 hours. Alternatively, you can do a combination of flight and bus; or take a train. 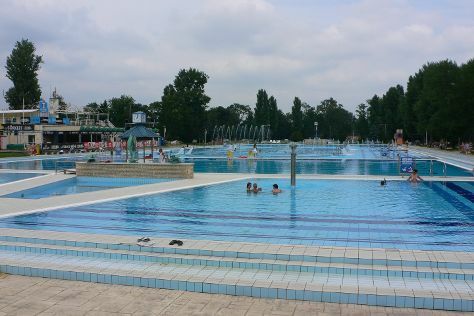 July in Bratislava sees daily highs of 33°C and lows of 19°C at night. You'll have a few hours on the 7th (Sun) to wrap things up before traveling to Budapest. Kick off your visit on the 7th (Sun): witness a stunning natural landmark at Palatinus Strandfürdő and then contemplate the long history of Fisherman's Bastion. On the next day, snap pictures at Szechenyi Chain Bridge, contemplate the long history of Hősök tere, then test the waters at a local thermal spa, and finally ponder the world of politics at Parliament. To find traveler tips, ratings, reviews, and other tourist information, read our Budapest route website . Traveling by car from Bratislava to Budapest takes 2 hours. Alternatively, you can take a train; or take a bus. Expect a daytime high around 33°C in July, and nighttime lows around 18°C. Finish up your sightseeing early on the 9th (Tue) so you can go by car to Ljubljana. On the 9th (Tue), explore the engaging exhibits at Museum of Illusions and then explore the activities along Lake Bled. Here are some ideas for day two: get in on the family fun at Minicity Ljubljana, then let the river carry you with a rafting and tubing tour, and then see the sky in a new way at Planetarij Ljubljana. To find more things to do, traveler tips, other places to visit, and more tourist information, read Ljubljana travel itinerary planner. You can drive from Budapest to Ljubljana in 4.5 hours. Other options are to take a shuttle; or take a bus. July in Ljubljana sees daily highs of 32°C and lows of 17°C at night. Wrap up your sightseeing by early afternoon on the 11th (Thu) to allow enough time to drive to Zadar. Keep things going the next day: kick back and relax at Nin's Lagoon and then kick back and relax at Simuni Beach. To find traveler tips, more things to do, where to stay, and more tourist information, go to the Zadar trip itinerary builder site . Traveling by car from Ljubljana to Zadar takes 4 hours. Alternatively, you can do a combination of shuttle and flight; or take a bus. Traveling from Ljubljana in July, expect nights in Zadar to be about the same, around 20°C, while days are a bit warmer, around 36°C. Wrap up your sightseeing on the 13th (Sat) to allow time to drive to Split. Kids will enjoy River Rafting & Tubing and Milna. Venture out of the city with trips to Trogir (Trogir Historic Site & Trogir Square) and Hvar (Franciscan Monastery, Spanjola, & more). On the 17th (Wed), spend a thrilling day on the water with a speed boat tour. There's still lots to do: steep yourself in history at Diocletian's Palace, make a trip to Fruit's Square (Trg Brace Radic), savor the flavors at Food & Drink, and pause for some serene contemplation at Church Of St. Roch. To see ratings, photos, and other tourist information, read our Split trip planner. You can drive from Zadar to Split in 2 hours. Other options are to take a bus; or take a train. Traveling from Zadar in July, you can expect nighttime temperatures to be a bit warmer in Split, with lows of 26°C. 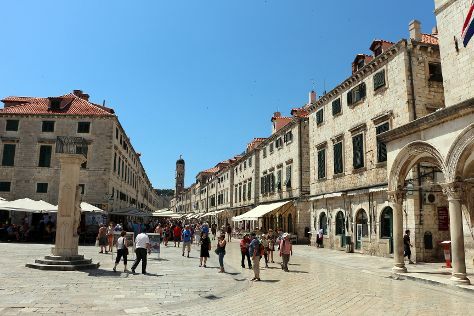 Wrap up your sightseeing on the 20th (Sat) to allow time to take a bus to Dubrovnik. Start off your visit on the 21st (Sun): take a stroll through Old Town, enjoy breathtaking views from Upper Corner Tower Foundry Museum, and then make a trip to Pile Gate. Keep things going the next day: step off the mainland to explore Island of Lokrum and then explore the ancient world of Walls of Dubrovnik. To see other places to visit, photos, where to stay, and more tourist information, read Dubrovnik trip planner. You can take a bus from Split to Dubrovnik in 3 hours. Other options are to drive; or fly. In July in Dubrovnik, expect temperatures between 34°C during the day and 24°C at night. Wrap up your sightseeing by early afternoon on the 22nd (Mon) to allow time for the car ride to Kotor. Kick off your visit on the 22nd (Mon): relax and float downstream with a rafting and tubing tour. On your second day here, enjoy the sand and surf at Plavi Horizonti Beach and then explore the activities along Bay of Kotor. To see traveler tips, ratings, photos, and more tourist information, use the Kotor online attractions planner . Drive from Dubrovnik to Kotor in 1.5 hours. Alternatively, you can take a bus. Traveling from Dubrovnik in July, expect slightly colder with lows of 20°C in Kotor. You'll have a few hours on the 24th (Wed) to wrap things up before traveling to Tirana. Start off your visit on the 24th (Wed): contemplate in the serene atmosphere at Et`hem Bey Mosque and then take an in-depth tour of National History Museum. On your second day here, take in the awesome beauty at Mount Dajti. To find traveler tips, maps, where to stay, and other tourist information, read our Tirana day trip planner. Drive from Kotor to Tirana in 3.5 hours. Alternatively, you can do a combination of car and bus; or take a bus. 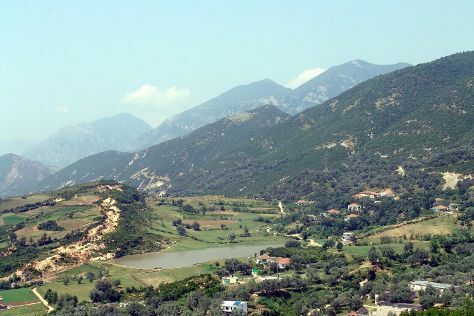 July in Tirana sees daily highs of 38°C and lows of 20°C at night. Finish your sightseeing early on the 26th (Fri) to allow enough time to travel to Paxos. Kids will appreciate attractions like Vrika Beach and Voutoumi Beach. For maps, reviews, photos, and more tourist information, read Paxos online tour itinerary planner . Use the Route module to find suitable travel options from Tirana to Paxos. Due to the time zone difference, you'll lose 1 hour traveling from Tirana to Paxos. Traveling from Tirana in July, Paxos is somewhat warmer at night with lows of 24°C. On the 3rd (Sat), you'll travel to Brindisi. Brindisi is a city in the region of Apulia in southern Italy, the capital of the province of Brindisi, on the coast of the Adriatic Sea. On the 4th (Sun), get engrossed in the history at Masseria Brancati and then enjoy the sand and surf at Togo Bay Beach. On your second day here, look for all kinds of wild species at Area Marina Protetta Torre Guaceto. To find reviews, photos, maps, and tourist information, read our Brindisi attractions planning tool . Use the Route module to find suitable travel options from Paxos to Brindisi. You'll gain 1 hour traveling from Paxos to Brindisi due to the time zone difference. Traveling from Paxos in August, you will find days in Brindisi are a bit cooler (34°C), and nights are about the same (26°C). Wrap up your sightseeing by early afternoon on the 5th (Mon) to allow enough time to drive to Naples. Naples is the capital of the Italian region Campania and the third-largest municipality in Italy after Rome and Milan. Kick off your visit on the 6th (Tue): delve into the distant past at Gli Scavi Archeologici di Pompei, then contemplate the long history of Ruins of Herculaneum, and then pause for some serene contemplation at Duomo di Napoli. To find more things to do, traveler tips, and other tourist information, use the Naples road trip planning tool . You can drive from Brindisi to Naples in 4.5 hours. Other options are to do a combination of flight and train; or fly. In August in Naples, expect temperatures between 36°C during the day and 25°C at night. Wrap up your sightseeing by early afternoon on the 7th (Wed) to allow time for the train ride to Rome. Kick off your visit on the 7th (Wed): explore the ancient world of Colosseum. Get ready for a full day of sightseeing on the 8th (Thu): delve into the distant past at Palatine Hill, steep yourself in history at Roman Forum, admire the local landmark of Trevi Fountain, then admire the striking features of Pantheon, and finally contemplate the long history of St. Peter's Basilica. Ask Inspirock to suggest an itinerary and make planning a trip to Rome fast, fun, and easy. Traveling by train from Naples to Rome takes 1.5 hours. Alternatively, you can drive; or take a bus. Expect a daytime high around 38°C in August, and nighttime lows around 24°C. Wrap up your sightseeing on the 9th (Fri) early enough to travel back home.